Health Psychology - Heimkaup.is – Matur, raftæki, snyrtivörur, bækur, íþróttavörur, leikföng og sjónvörp. Allt sent heim samdægurs. 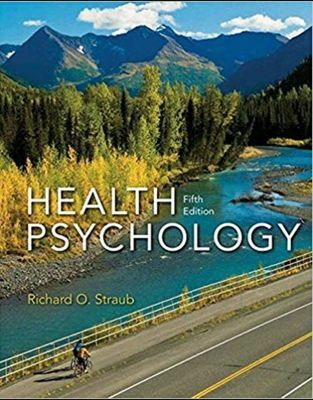 Richard Straub's Health Psychology shows students how psychology and health are interconnected. Using real world examples, Straub encourages students to make meaningful connections between the science of health psychology and their own everyday experience. The text is comprehensive in its approach, and incorporates the latest research as it examines the field’s main ideas and models a scientific way of thinking about those ideas. Hægt að prenta út 2 bls. Hægt að afrita 2 bls. Where Do Health Psychologists Work? How Does Stress Make You Sick? Interpreting Data: Who Are the Uninsured and Underinsured? Is It Ever Too Late to Begin Exercising? Why Don’t More People Exercise? Your Health Assets: How Good Is Your Sleep? Why Do Hostility, Anger, and Depression Promote Cardiovascular Disease? Your Health Assets: What Is Your Risk of Developing Skin Cancer? What Is Complementary and Alternative Medicine? How Widespread Is Complementary and Alternative Medicine? Does Complementary and Alternative Medicine Work? Bókahillan þín er þitt svæði og þar eru bækurnar þínar geymdar. Þú kemst í bókahilluna þína hvar og hvenær sem er í tölvu eða snjalltæki. Einfalt og þægilegt! Þú getur nálgast allar raf(skóla)bækurnar þínar á einu augabragði, hvar og hvenær sem er í bókahillunni þinni. Engin taska, enginn kyndill og ekkert vesen (hvað þá yfirvigt). Þú getur flakkað milli síðna og kafla eins og þér hentar best og farið beint í ákveðna kafla úr efnisyfirlitinu. Í leitinni finnur þú orð, kafla eða síður í einum smelli. Þú getur auðkennt textabrot með mismunandi litum og skrifað glósur að vild í rafbókina. Þú getur jafnvel séð glósur og yfirstrikanir hjá bekkjarsystkinum og kennara ef þeir leyfa það. Allt á einum stað. Þú lagar síðuna að þínum þörfum. Stækkaðu eða minnkaðu myndir og texta með multi-level zoom til að sjá síðuna eins og þér hentar best í þínu námi.